This event was based at the 'new' (actually 1594!) Sherborne Castle, which is in a beautiful part of Dorset. 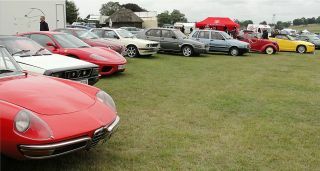 The very large grassed area in front of the building was divided between club stands and an autojumble in one half and line upon line of general entries in the other and it also contained quite a large classic vehicle auction. 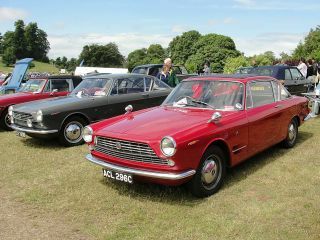 Certain special exhibits were arranged directly in front of the castle, but everywhere else it was a matter of strolling around and being constantly surprised and delighted: How often do you see one of these Fiats, for instance, never mind two? We thought that it would be nice to visit the event and to mount a Club display, especially as we could also incorporate something for the Alfa Romeo 100th anniversary. 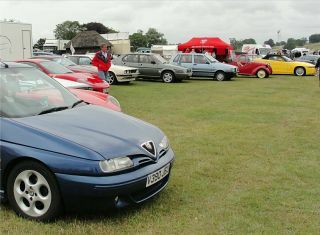 Thus we exhibited a range of cars encompassing Fiat, Ferrari, Lancia and Maserati plus the Alfas, including a few that were not to be found on the other Alfa 100 displays there. 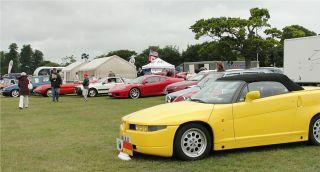 Quite a number of Italian cars were elsewhere on site too, along with a fantastic collection of other vehicles from the very rare to those more commonly seen at events. Luckily the sun broke through after a very dull start and so with the added attraction of the Castle and its grounds a very enjoyable day was easily had.